The drive in was only 17 minutes, but some mornings that was a long 17 minutes of apprehension of what the day was going to hold. The apprehension did not come because I did not know how to perform my job, or the requirements of it. It arose from a place in my heart that did not want the conflict any longer. The fear of wondering what the drama of the day was going to be. All those things that had nothing to do with the task at hand that the organization was paying me to perform. Snide remarks, childish behavior that I should have been smart enough and strong enough to rise above; yet eventually I would find myself pulled into her snare. And there we were, in my boss’s office, trying to explain the situation that would appear it could be related to a function of the job, but was always covered thick with overtones of jealousy, childish cattiness and sometimes outright vengeful attitude. The problem for me was while I did not start these emotional battles that vied for my time and attention, I allowed myself to get sucked into them, allowing them to steal my peace. I wasn’t the only one. I heard another say they started dreading on Sunday coming into work on Monday, wondering what the next “episode” to befall us would be. Mark Twain was quoted as saying “Never argue with a fool, onlookers may not be able to tell the difference.” Allowing ourselves to get caught up in the drama essentially put us all in the same classification “A bunch of female drama.” And then, one day as I was frustrated and angry, this verse came to mind in an almost audible voice; “Love your enemies. Pray for them”. And in that one instant, that realization changed my actions and thus changed the rest of my time at that company. I started to earnestly pray for her, turned the emotions of anger into feeling sorry, realizing that her actions were probably covering up a hurt or heartache that I knew nothing about. One day as she approached my desk I said to her “I know we have not always gotten along, but those days are over. I’m not letting you steal my joy and peace anymore. I won’t argue with you, but I will pray for you.” I don’t think she knew what to say. But I can tell you what happened. Things changed. We actually became friendly and I no longer dreaded going to work. I never felt like I “lost” because I didn’t change her, I felt like I won because I stood up, took back my peace and refused to be a part of the drama. “Enemies” is a strong word. We think of foreign nations, hate groups, etc. when we hear the word enemy. Dreading going to work every day, because of the actions of someone else, becomes an enemy to your soul when it steals your peace. I have to admit, this is the area that at one point during they early years of my journey, I likely struggled in the most. I can get passionate about my work and when I don’t see something being done the right way (or the way I perceive it to be the right way), when I see people in charge making bad decisions, I would let it frustrate and aggravate me and steal my peace. I have seen co-workers over the years spend their days, and sadly sometimes evenings, trying to determine how to get rid of that one person who makes their lives uncomfortable; the one who is an enemy to their soul. And the truth is, at the end of the day, I’ve never seen it happen. Chances are likely that person is not going to go anywhere. So when you have no power to change the situation, there is only one thing you can change, how you let it affect you. I have found that when I come upon someone like that and I realize I’m going home stressed and unhappy and wearing a grimace more than a smile – I need to do some self-evaluation. And when I pray for that person, when I ask God to help me find love for them in my heart, when I offer to help them or offer suggestions instead of condemnation and criticism; chances are good it did not change them one bit, but it changes me. It keeps me from losing my peace. So often we want God to remove the obstacle in our path to make life easier. “Hey God, when are you going to change the other person?”, when sometimes what we need is to look inward and build our faith. If life was a rose garden, how would we ever learn to trust God to fight our battles, learn the right way to love others? You go to work, do the best job you can do, stay quiet in the storm and say “God this is yours, You got this. I’m going to stand on your promise”; in Romans 8:28 you tell me “All things work together for good for those who love the Lord.” I often remind myself of this truth: “Joy comes as a by-product of confidence in God, not certainty in one’s circumstances”. There is true freedom in surrender! Not surrendering to your enemies; surrendering the battle and the outcome to God. Letting His promises become an anchor in your storm. While the example I started this story with happened many years ago, I share it because there is power in loving your enemies. Forgiveness doesn’t set them free, it sets you free! Because I know so many people who confide in me of difficult personalities they have to deal with in their work environment. You are the master of your day – remember that! People only steal from you what you let them. You do NOT have to let anyone steal your peace. For a long time I had a post it note on my computer screen that said “Be Still” – a gentle reminder when things got crazy that I did not need to get crazy with them. I needed to “Be Still” and know that this storm will pass. In Matthew 5: 43-47 it says; “You have heard the law that says, ‘Love your neighbor and hate your enemy’. But I say, love your enemies! 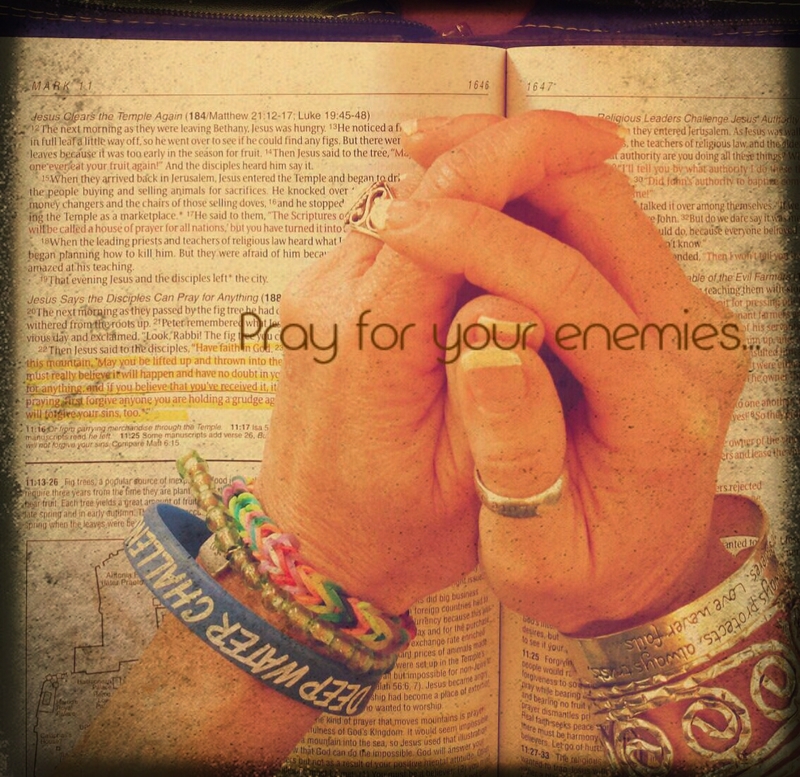 Pray for those who persecute you! In that way, you will be acting as true children of your Father in heaven. For He gives his sunlight to both the evil and the good, and He sends rain on the just and the unjust alike. If you love only those who love you, what reward is there for that? Even corrupt tax collectors do that much. If you are kind only to your friends, how are you different from anyone else? Even pagans do that. But you are to be perfect, even as your Father in heaven is perfect.” It’s easy to love our friends, but a true test is to love those who sometimes are not so loveable. My mother had a sign hanging up on the wall that said “People often need loving the most, when they deserve it the least.” And sometimes, that love when they least deserve it, will change things. I loved this! I don’t dread going to work because I love what I do and the kids. But it hurts my heart to see grown adults/ staff who act like our students during conflict with other staff. Or other staff that say they walk a Christian lifestyle but you would never know by their rudeness and childish actions. I always send love to them no matter what especially when they have wronged me but now i will add them to my prayers. Thank you Kris!